We couldn’t be more excited to be partnering with Studio East for the long awaited return of the Kirkland Community Musical. Both organizations are joining forces to present Meredith Willson’s classic The Music Man. 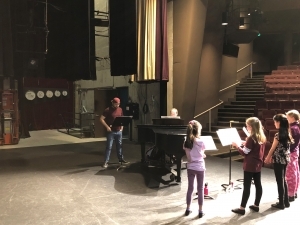 Auditions and callbacks for the show took place at KPC over the past couple weeks and had a large turnout, many of which were Kirkland residents. 39 talented performers were cast. Now, those cast members will head into rehearsals to get ready for the March 9 opening night. Join Sofia and the rest of the cast for one of their performances on March 9, 10, 15, and 16. Tickets are available here.